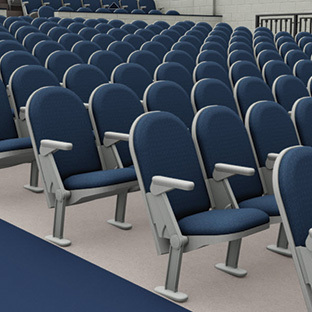 The only fully functional telescopic or retractable seating available Revit families along with upholstered and fixed stadium seating to complete your design. Hussey Seating products (especially telescopic products) are generally custom configurations that don't readily lend themselves to creating small, workable Revit models. Accordingly, we've taken a hybrid approach of creating "light" models (or families) that will provide you with most of the design, visualization and 3D modeling benefits desirable at the front end of the design process, while keeping file size constrained in order to enhance model performance. Once your working design is complete, your local Hussey Seating dealer will provide you with our current 2D submittal drawing package based on the exported "schedule" of items included in your design to facilitate the construction process. This 2-D drawing package will be a fully code compliant execution of the initial 3-D design, complete with final seat count, proper aisle size & placement, and code-compliant ADA accommodations. This process can be repeated as needed during the design process, giving you the freedom to iterate the 3-D design and ultimately receive a code compliant package of 2-D submittal drawings to construct the building when the design is finalized. We strongly urge you to carefully read the "README.txt" enclosed with each family, and to connect with your local Hussey Seating Dealer in order to facilitate the design process. Click on a image to download the Revit family.